The selenium sulfide market is extremely consolidated and has been characterized by an oligopolistic environment globally. Investments in emerging markets such as Asia Pacific, Latin America, and Africa present immense scope for growth in the near future, as does new product development. While the growing demand for personal care products is a key factor driving the global market for selenium sulfide, the imposition of strict government regulations pertaining to its application in personal care products also poses a severe challenge. Keeping this in mind, the demand for selenium sulfide is estimated to rise at a modest 2.2% CAGR from 2016 to 2024. The revenue generated by this market in 2015 was pegged at US$27.5 mn and is likely to reach US$35.6 mn by 2024, expanding at a 2.9% CAGR therein. In terms of product, selenium sulfide has been segmented into selenium sulfide 99.0% and selenium sulfide 99.99% based on its purity level. Selenium sulfide 99.0% is the dominant product type due to its cost-effective features. The personal care industry is the leading end-use segment, wherein selenium sulfide is used in anti-dandruff shampoos due to its anti-infective properties. Anti-dandruff shampoos and dermatological skin lotions form key application sub-segments in the personal care segment of the global selenium sulfide market. Selenium-sulfide-based lotions are also used as veterinary medication to cure eczema and dermatomycoses. For instance, selenium sulfide is employed in dog shampoos to remove excess oil and scaling of the skin. Different types of skin treatment lotions are prepared using selenium sulfide as a base product for veterinary medicines in the veterinary care industry. The global market for selenium sulfide has been segmented into Asia Pacific, North America, Europe, Latin America, and the Middle East and Africa. 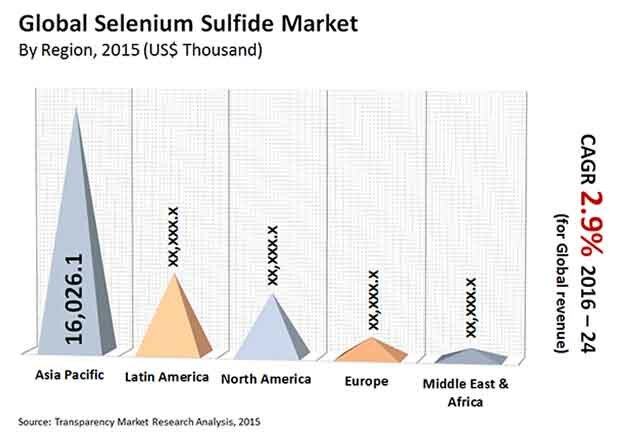 Asia Pacific accounted for the leading share in the selenium sulfide market in 2015 due to the increasing demand for personal care products and cosmetics in the region. Rapid growth in population and an increase in disposable income are positively impacting the lifestyle and buying preferences of consumers. This, in turn, is boosting the personal care industry in the region. Rising awareness about veterinary care in Asia Pacific, coupled with an increase in the usage of veterinary medicines, is also expected to drive the APAC selenium sulfide market in the near future. The region is anticipated to maintain its dominance during the forecast period, led by rapid growth in emerging economies such as China, India, Thailand, and Singapore. China is the leading consumer of selenium sulfide-based products in the world; the country accounts for more than 50% share of the total consumption in Asia Pacific. Latin America is anticipated to be one of the key regions for selenium sulfide-based products in the global selenium sulfide market due to the constant increase in demand for hair care products in the region. Brazil accounts for a share of more than 10% in the global hair care product consumption. Major players operating in the global selenium sulfide market include Abcr GmbH, Alfa Aesar, Wockhardt Ltd., FAGRON, G&W Laboratories, Adisseo, Salvi Chemicals, and Omkar Specialty Chemicals Ltd.
Selenium sulfide is sulfide salt of selenium. It is present in bright orange or yellow-orange powder or tablet form at room temperature. It is insoluble in water or ether. It can be dissolved in carbon disulfide. Selenium sulfide decomposes in alcohol and can get ignited when it comes into contact with silver oxide. When heated, it releases toxic fumes of sulfur oxide and selenium. Selenium sulfide is an anti-infective agent, which is used for the treatment of dermatitis and dandruff of the scalp. It is employed in the treatment of skin infections such as tinea versicolor, sehorrheic dermatitis. It is also used in pharmaceutical formulations for veterinary medicines. The report provides in-depth analysis and forecast of the selenium sulfide market on the global and regional level. It includes forecast for the period from 2016 to 2024 in terms of volume (kilogram) and revenue (US$ thousand). Quantitative data has been derived through extensive secondary research of the global selenium sulfide market. Secondary sources typically include company websites, relevant magazines, government documents, and press releases. The top-down approach has been adopted to derive the regional numbers from global revenue and volume figures. Furthermore, the bottom-up approach has been employed to derive data for various product segments based on demand for selenium sulfide in each geographic segment. A combination of top-down and bottom-up approaches helps validate the quantitative data. The data was further validated with the help of primary research with industry experts to ensure accuracy of derived numbers. Detailed analysis of various factors driving the global selenium sulfide market has been included for astute decision making. Impact of these drivers has been included with data to substantiate research findings. Furthermore, factors restraining market growth have been included for better understanding of the market. Impact of these restraints has been analyzed over the course of the forecast period. The report also comprises various opportunities available for market growth during the forecast period. Opportunities entail untapped or recently explored factors that are anticipated to drive the selenium sulfide market during the forecast period. The report includes value chain analysis to help understand the industry thoroughly. Value chain analysis comprises detailed evaluation of the roles of various entities involved in the selenium sulfide industry, from raw material suppliers to end-users. Various processes employed in the manufacture of selenium sulfide have been included in the value chain analysis. Porter’s Five Forces model has been employed to determine the degree of competition in the market during the forecast period. Company market share analysis has been included for better understanding of the competitive landscape. Company market share analysis comprises the market share of dominant players in 2015, based on their production capacities. Furthermore, market attractiveness analysis has been conducted to analyze product segments that are expected to be lucrative during the forecast period. This is based on various factors such as market size, growth rate, profitability, raw material procurement, and competition in each product segment. Based on product, the selenium sulfide market has been segmented on the basis of purity of the product into selenium sulfide 99.0% and selenium sulfide 99.99%. The report comprises detailed analysis of all the segments in the regional and global market, and forecast based on current and future trends in the industry in terms of volume (kilogram) and revenue (US$ thousand). In terms of region, the market has been segmented into North America, Europe, Asia Pacific, Latin America, and Middle East & Africa. Demand for selenium sulfide in each of its application segments has been analyzed and forecast for the period of eight years. The report also comprises profiles of leading companies in the selenium sulfide market. These include Abcr GmbH, Alfa Aesar, Wockhardt Ltd., FAGRON, G&W Laboratories, Adisseo, Salvi Chemicals, and Omkar Specialty Chemicals Ltd. Various attributes of these companies such as company overview, business strategies, and recent developments form the core of the company profiles section.